I've been loving making my own patterns lately. It's such an easy thing to reach for - a pad, some watercolors, maybe a stamp...Late at night when my creativity is not particularly thriving, or if I'm having one of those days, I can still whip up something fun, with little to no effort. And it's wonderful to be able to use these bits later in my cards. 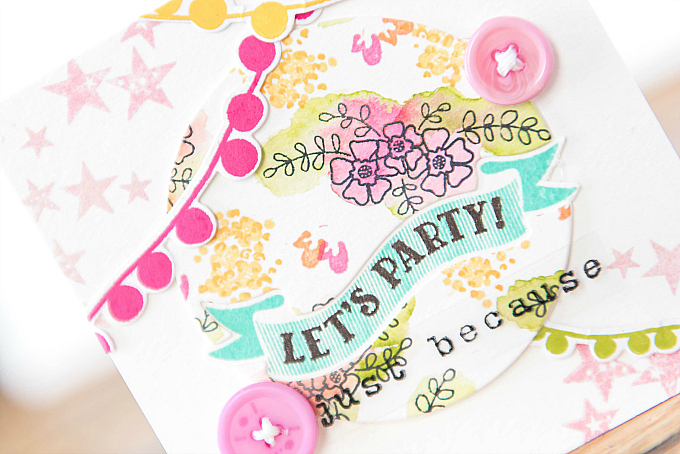 Today I'm sharing three cards created with the stamped and colored paper I made recently (shown below). This little card made the journey to a faraway place recently, and I hope it brought lots of sunshine and happy vibes to our dear friends, who bring so much of that to our lives. To start this card, I watercolored a soft aqua center, followed by stamped triangles from PTI's Southwestern Style stamps in Green Parakeet ink. I used PTI's Scene It: Celebration die to cut out the circle banner frame. Of course, I kept the negatives, which made for a couple more fun cards (below). 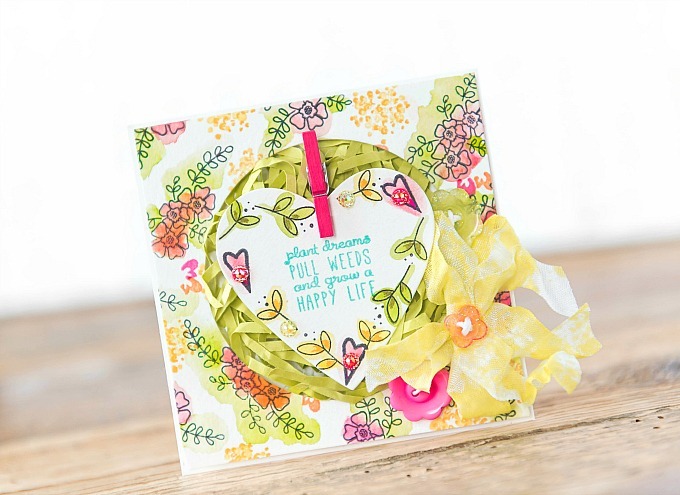 To the top of the card, I added a striped bow, which I colored with Zig Clean Color Real Brush markers. 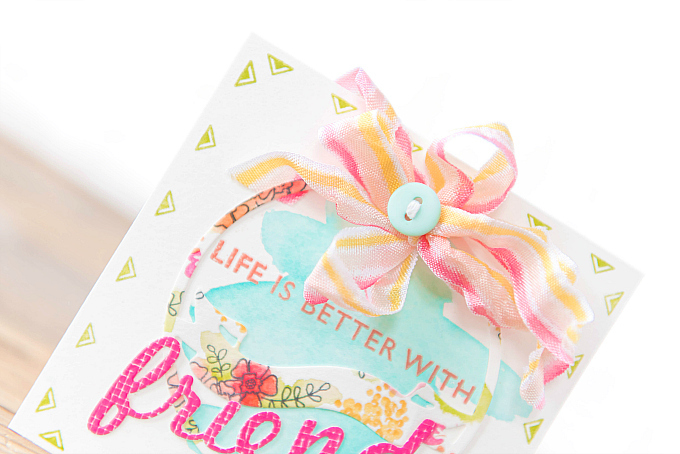 Love how fun and vibrant striped bows can be! To finish off the card, I stamped a sentiment from PTI's Wonderful Words: Friends stamp, embossed in Lawn Fawn's Rose Gold embossing powder. 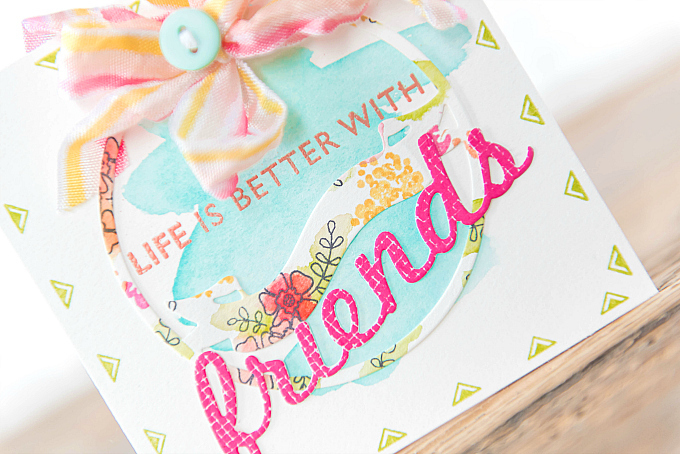 I used PTI's Wonderful Words: Friends die and matching stamp set for the larger die-cut, stamped in Raspberry Fizz ink. 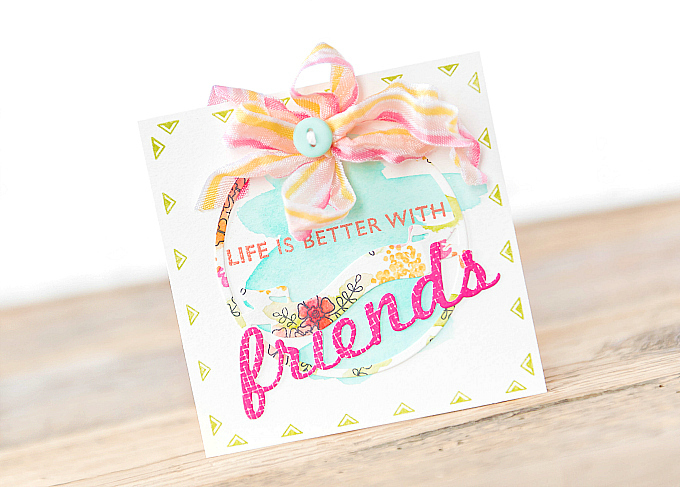 For this next card, I used the negative die-cut of the colorful paper, and adhered it to center of the card. In the space between the die-cuts, I stamped a banner and sentiment, using PTI's Scene It: Celebration stamp set, in colors of Hawaiian Shores and Smokey Shadow. 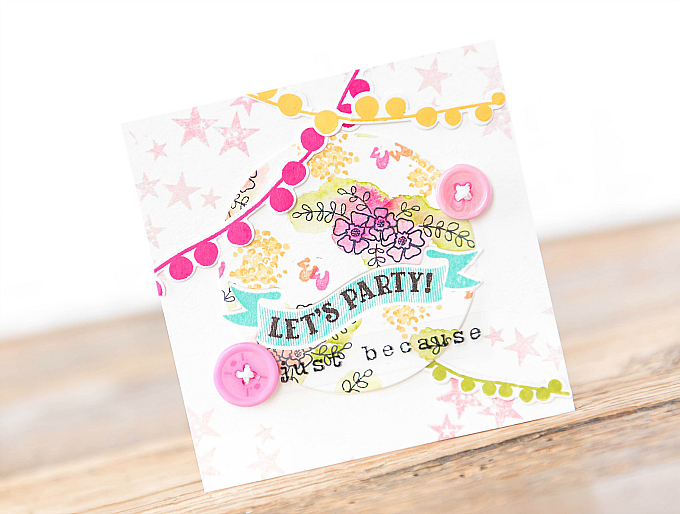 At the top of the card, I stamped some distressed stars with PTI's Scene It: Celebration stamps, and used PTI's Super Succulents stamps and dies for the banners, stamped in Archival Buttercup ink and PTI's Raspberry Fizz ink. 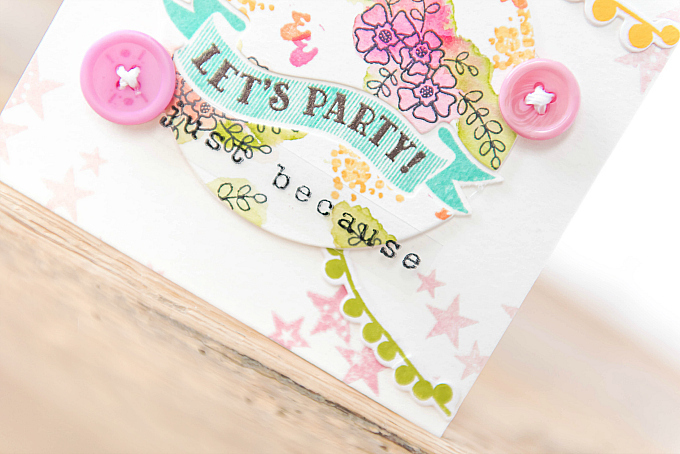 I added some more starts to the bottom of the card, and a couple of darling buttons. For the last card, I used the remaining colored pattern, for a look that's a bit more bold than my usual style. 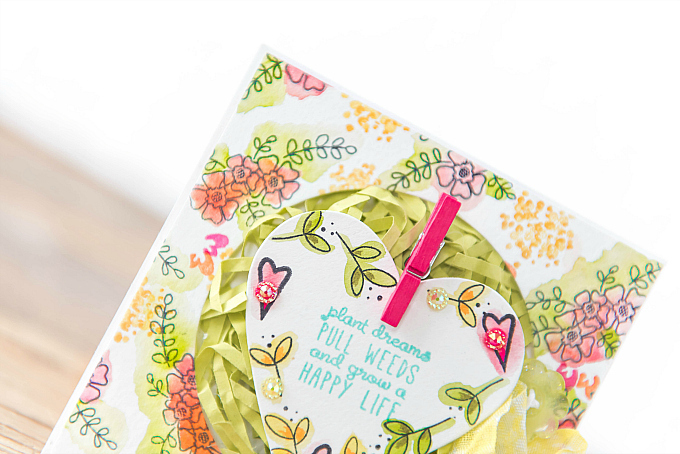 I used a little bit of decorative paper grass to fill the center where I adhered a stamped heart, cut with PTI's Heart Prints die. I stamped the sentiment using PTI's Home and Garden stamp set, and added some sweet little branches from PTI's Rustic Wreath stamp set. I colored all the leaves using my Zig markers. 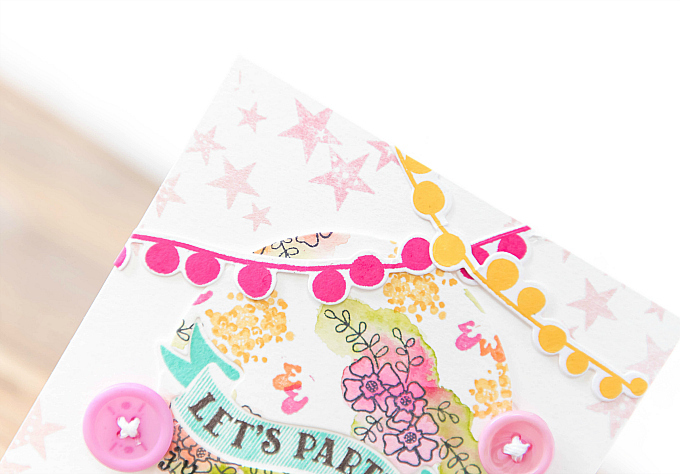 To finish the card, I added a colorful clothespin, some sweet sequins, and a bright yellow bow! 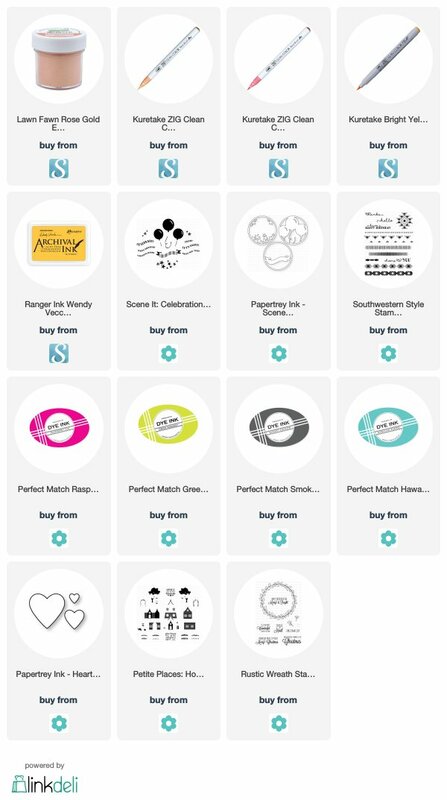 Here's a looksy at how it all came together. Ahh all the colors! They're fun, no? Everything is lovely, as usual! 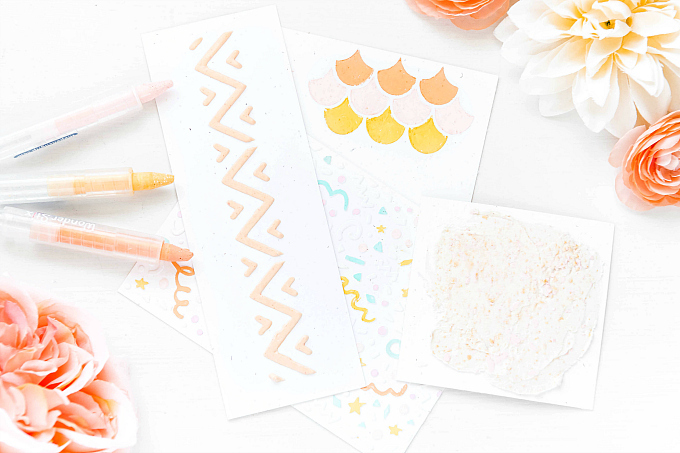 I should try making my own patterned paper! Yours turned out so nicely! A trio fo pure loveliness Ivana! The flow on each card is wonderful and I like the colors. Just fabulous, all of them! Thank you so, so much, dear Karen! I hope you are having a good Summer and that all is going well. Thinking of you often, sweet friend! How divine!!! LOVE the colors you used, the way you used the watercolor, the fun GRASS? Once again you hit it out of the park. A feast for the eyes!!! Aw thank you, Nora! 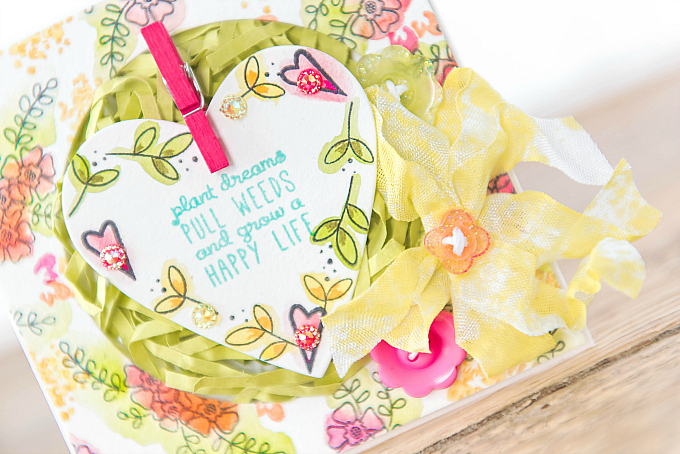 I thought the grass worked with the sentiment - you know keeping weeds out and all! lol So glad you liked it!! Big hugs! Oh wow--such beautiful cards, Ivana! Never crossed my mind that ribbon could be colored with Zigs!